Successfully Added 3.5 Inch LCD Monitor (CCTV Testing Kit) to your Shopping Cart. 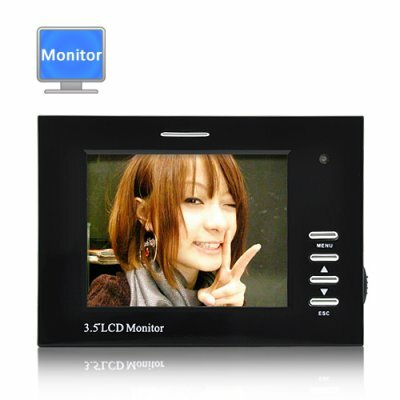 3.5 inch LCD monitor for CCTV camera installation and testing! You can now test all CCTV cameras with this portable 3.5 inch LCD monitor that is specifically designed for testing video feeds and video quality when installing CCTV cameras. This 3.5" TFT LCD monitor is small and lightweight enough that you can carry it everywhere for instant video display. To make life easier, this LCD Monitor comes with a portable carrying arm strap. The arm strap will enable you to wear this LCD monitor on your arm, so that both your hands are free while you're up the ladder doing what you do best. If you're a technician, then this is the perfect gadget for you. This LCD monitor is designed to make your work life wire-free and more fun. This 3.5" LCD monitor comes with a single 3.5 jack to BNC and AV IN for easier operation. This LCD monitor runs of either direct power connection using the included AC adapter, or by using 4 AA batteries for more mobility. Although this LCD monitor is primarily designed for testing CCTV security cameras, it is still an LCD monitor with AV out and Camera in, meaning you can use this LCD monitor in your car as a rear view monitor. This 3.5 Inch LCD monitor is brought to you at a wholesale price. Click "Add to Cart" now and Chinavasion will express ship you a sample straight away. Can this 3.5 inch LCD monitor also be used as a permanent surveillance monitor? Of course, this 3.5 Inch monitor can be used for on the go testing or can simply be mounted using the included mounting hardware to be permanently stationed for surveillance.